If I say free, useful and open source – do you say Microsoft? I didn’t think so. But this time around, it looks like Microsoft has pulled its act together and released a really useful Word add-in for chemists called Chem4Word. The press release is found here, and the download link and a demonstration video are available here. I have only played with it for about five minutes now, so I suppose the jury is still out. However, I like what I see so far! By all means, if you try it out and find it useful, please drop me a comment. I found you on twitter, then your wonderful blog. 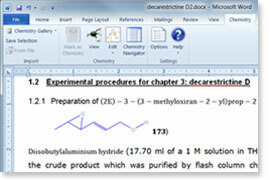 I have just installed Chem4Word and think it is brilliant. Although when I try to add a formula from pubchem, it always says service has timed out. Is it just me that has this problem?